I'm interested in running a game of Mage the Ascension (20A) and I'd love for a couple of people to come along with me. I'm looking to start out with a very small group. No more than three people or even a one-on-one. Really, I'm looking for quality over quantity; characters that we can dig deep into in an open world setting. I am cautiously open to vampire or changeling characters but they will be a much harder sell. The Dallas/Fort Worth Metroplex is home to millions of people, spread across a huge chunk of north Texas and closely connected with cities to the north and south along the major highway arteries. It has everything from the highest of technologies and finance to a thriving arts scene. There are also quite a few universities in the area including SMU, TCU, University of North Texas, Universities of Texas at Dallas and Arlington, several strong junior universities. Yes, you can sometimes see herds of cattle or horses but most of those are for financial subsidies rather than real ranching. It's said that noone is born in the area, with populations from across the world, Latin America, Indian, China, southeast Asia, Eastern Europe, several countries in Africa.. the world. In short, it shouldn't be a problem having a wide range of characters. So, please, read up on the game and the area. Hopefully, a few folks will let me know if they are interested and we can work on getting something going. Last edited by Spectrum on Wed Oct 10, 2018 11:24 pm, edited 1 time in total. How much of the metaplot will you be using? Hi Enigmatic One. Thanks for the question. I could probably spend a few pages going into it in detail. Is there something specific that you are curious about? My plan is to start off the character/s in the shallow end of the pool and getting deeper if the story points that way. Many of the metaplot items won't really be relevant at that level. Also, its nearly two decades since Revised came out so things have had time to evolve past that period. Yes, the Avatar Storm did happen. Ask ten people and you'll get a dozen answers on why it happened. It raged for a few years (long enough to clear the decks of the major named godlike characters). Today, every once in a while it'll cause problems but things are mostly back to normal. No, the Technocracy did not go on a genocidal killing spree, killing off all the Crafts or driving them into the Traditions. And no, they didn't win the Ascension War either. If anything, they've lost some ground as people get distrustful of where technology can lead us. The Technocracy and the Traditions aren't going to get along on a large scale anytime soon but on a minor scale, they might cooperate. Hope that points you in a better direction. There's too much ground to cover quickly so if there's something that you'd like to discuss, I'd like to hear. So this is a Tradition focused game? Any particular themes? Combat? Politics? Other? With a small enough player base, I can pivot towards a Technocracy game if that is where the interest is. So far, I've been building more in a Tradition/Craft/Orphan direction. I'm also comfortable with running parallel storylines. Themes: Interpersonal relationships, a sense of wonder, politics, establishing oneself in the world. I'd want to talk with players before hand to get a better sense of what toys we want in our sandbox. I'm looking for fleshed out characters. Where they've been, where they want to go, what they Believe in enough that they are willing to go beyond the masses and have reality respond to them. What would interest you in a small mage game? What kind of character would you want to play? What themes would you like to explore? What parts of the overgrown kudzu-like metaplot would you like to see developed? Any special NPCs that hold an interest for you? I am very game. I have the Mage: The Ascension book that I bought back in 1996. I'm not sure how much the game has changed since then. The whole "World of Darkness" series was a big thing for awhile, but I had no one to game with when I got out of graduate school. Do the "Sons of Ether" still exist as a tradition? I'd be interested in coming up with a concept. The mechanics of the game have improved quite a bit since 1996 but the fundamental concepts remain mostly the same. The Sons/Society of Ether is still going strong. In recent years, they have found popularity in the DIY/maker community. A number of notable members have also come from cosplay/fashion design and DieselPunk. Adam Savage may not be an Etherite but is an inspiration for them. hmm might try either David my Every mage or my Kickboxing Hacker Eve. Davids a sort of jack of all trades mage who learned from a bit of a renegade from the traditions think Qui gon jin as a mentor following his own rules but aiding the traditions as it were. David grew up to be just as much of a renegade as his mentor much in the Harry Dresden vane and lives by the motto Do the right thing no matter what it costs you. Hes very much inspired by Dr Who and Dresden in that regard and ive used him as a proxy Mage in several games such as B5 Stargate and a couple of WOD campaigns where I couldnt use Dr Arcane. he tends to show up when needed and vanish afterwards and has a knack for blatant magic that would cause most mages to explode in paradox fits. Eve is a virtual Adept with a hint of Akashic who basically was inspired a bit by the Matrix, Parkour, and Mirrors Edge videogame, maybe a bit of Watch dogs with how she gets around the city and does what she does. lots of ree running and she can use Muay Thai to kick serious arse. Hey catsi, thanks for the interest. Mark me as hesitantly intrigued by both concepts. Based on the short description, I'm not sure how David wouldn't flame out as paradox devours him. What group do you see him belonging to? Eve has more potential. What is her interpretation of the Virtual Adept paradigm? How does she interact with the rest of the group? Most of the way he avoided paradox was very smart applications of his power only ever got hit once by paradox his entire rp career and it basically got turned into part of the adventure. Hi folks! I think that there has been enough interest to turn this into something. I know that there have been a few changes to the rulesset over the years, so please feel free to let me know if you have questions. So, this is the recruiting thread now? What kind of PL are you gunning for? Any restrictions? House Rules? Yep. I want to get this game going. Standard Mage the Ascension 20th Anniversary builds using the old World of Darkness system. I suspect that the biggest thing to change between editions is the list of talents/skills/knowledges. 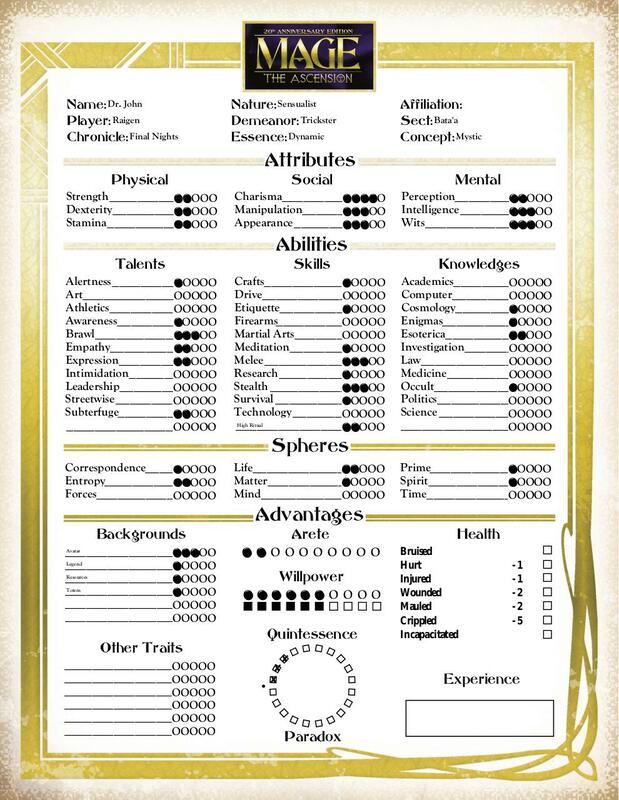 I'll look for a better image of the current character sheet when I get home from work. In the meantime, here's a sample. Not my character. Not a better sheet, but a free collection of official character sheets.